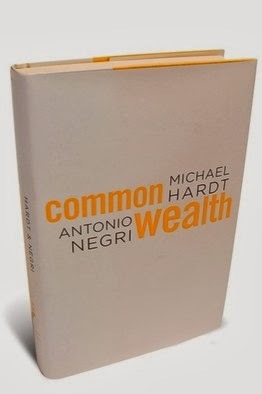 Commonwealth by Hardt and Negri is the third book in their series following Empire and Multitude. In Empire Hardt and Negri sought to define the state of the world as a complex network that is neither modern or post-modern, but rather Empire.In Multitude they sought to critique the current state of the revolutionary political movments and find theorize new ways of struggle based on defining the world as Empire. The text Commonweath is about creating solidarity. First let me define some key terms that are used through the series. Empire - Essentially, they are using this term, albeit in a different sense, the way Marx used the word Capital. Where capital was about who had power over creation and maintenance of resources, empire is about who has the control over creation of subjectivity. Multitude - Multitude, is their word for, proletariat. The reminds me Alain Badiou's arguments in Being and Event in that the clusters people are not easily slapped into categories and/or social classes. The idea of who is poor varies, and is so nuanced with political infighting that new terminology is required to conceptualize what it is that we are talking about. Commonwealth- The chapter entitled De Singularitate 1: Of Love Possessed appears to define commonwealth as the social creation of love. Although, in the context of this chapter love is only used in association with Common and not wealth. Wealth implies a kind of repository. I have a difficult time with the idea that you can save love for later. The twist that Hardt and Negri bring to the table is that after they deconstruct the ruling narratives power they don't refuse to construction from the grave of the deconstruction. What does this mean? There is a genius scene in My Soul To Take where Brandon is having the crap knocked out of him by a bully, and between punches he is thanking the bully and commenting on how wonderful the punches feel. In in a sense this strategy is Jesus's concept of turning the other cheek with a satirical twist. What Hardt and Negri suggest is that as we are picking our political fights we should avoid the trap of fighting against our oppressor direction. Instead we should fight in such a way that radically upsets the victim vs aggressor dynamic. What this does is create a new territory for conflict in which our opposition has no ready made language to articulate it's footing. This strategy goes several steps further than Saul Alkinsky's idea of political judo. While Alinksy sought to fight political battles in the experience of your allies, and outside the experience of your enemies, Hardt and Negri argue that we need to fight outside the experience of allies and enemies. To engage in the combative relationship in such a way to create new subjectivities and new worlds of meaning. The clearest contemporary example of this is the Occupy Wall Street movement. What they succeeded at more then any other group at the time time was creating a clear understanding of what they were doing for those who were working for social change internally to the group, and completely confused everyone who was outside of it. I think the psychotic way the police responded to Occupy demonstrates how utterly lost the powers that be were at mounting an opposition.